This product is a broad-spectrum protein with a high protein level. With each dose of this protein you can get more than 6.5 g of branched-chain amino acids (BCAA) into your body. 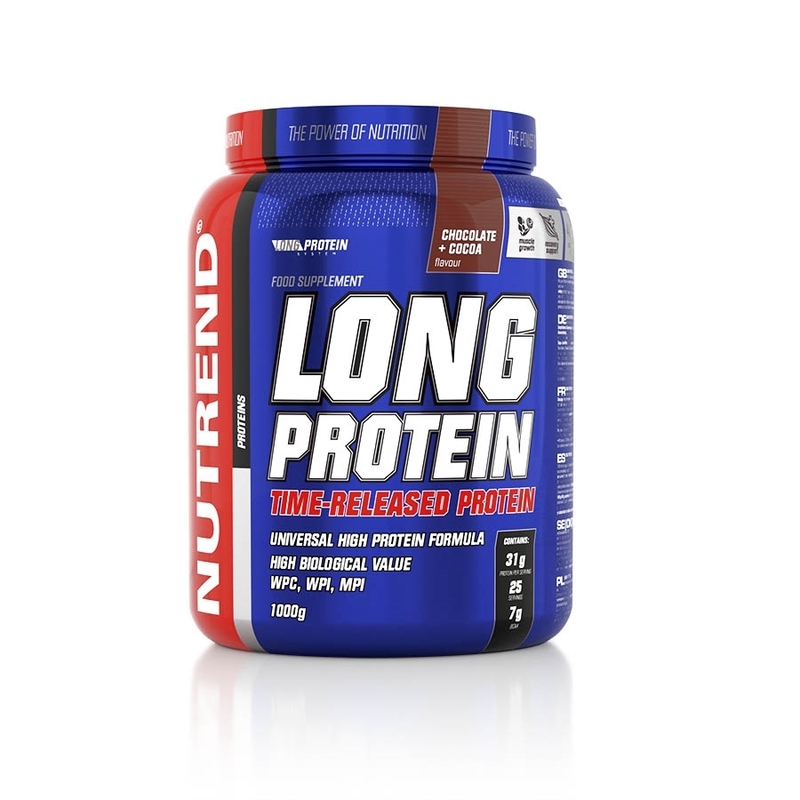 The product is enriched with vitamin C and vitamin B6, which help to reduce fatigue and exhaustion. This product is a broad-spectrum protein with a high protein level. 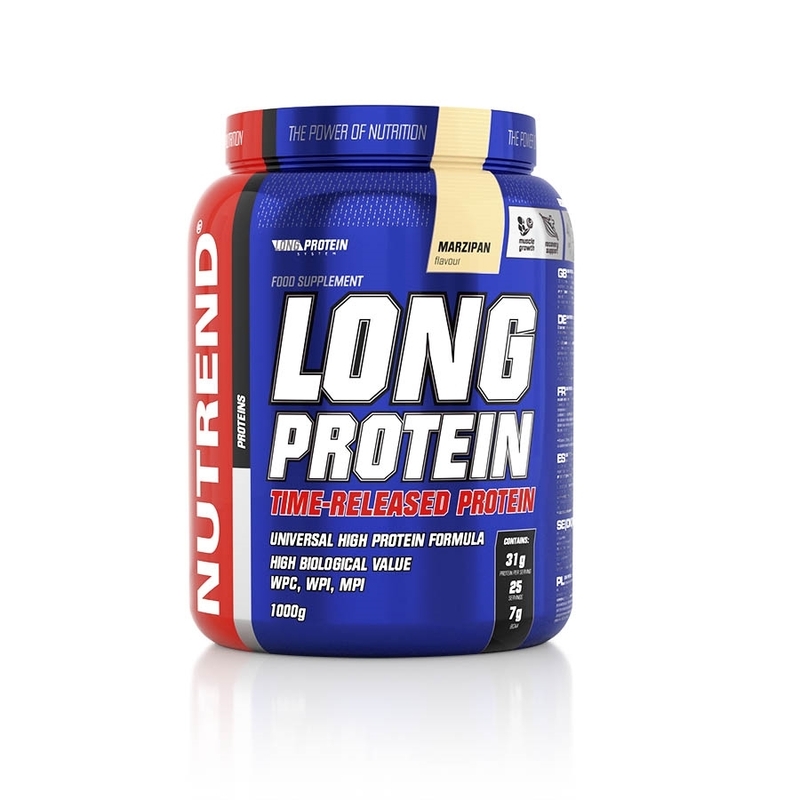 With each dose of this protein you can get more than 6.5 g of branched-chain amino acids (BCAA) into your body. The product is enriched with vitamin C and vitamin B6, which help to reduce fatigue and exhaustion. 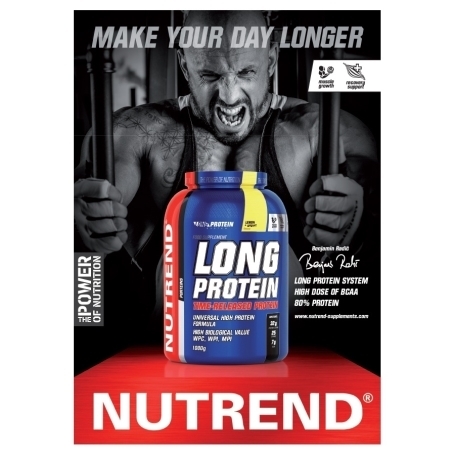 It is also enriched with vitamin D, which contributes to the absorption and utilization of calcium. 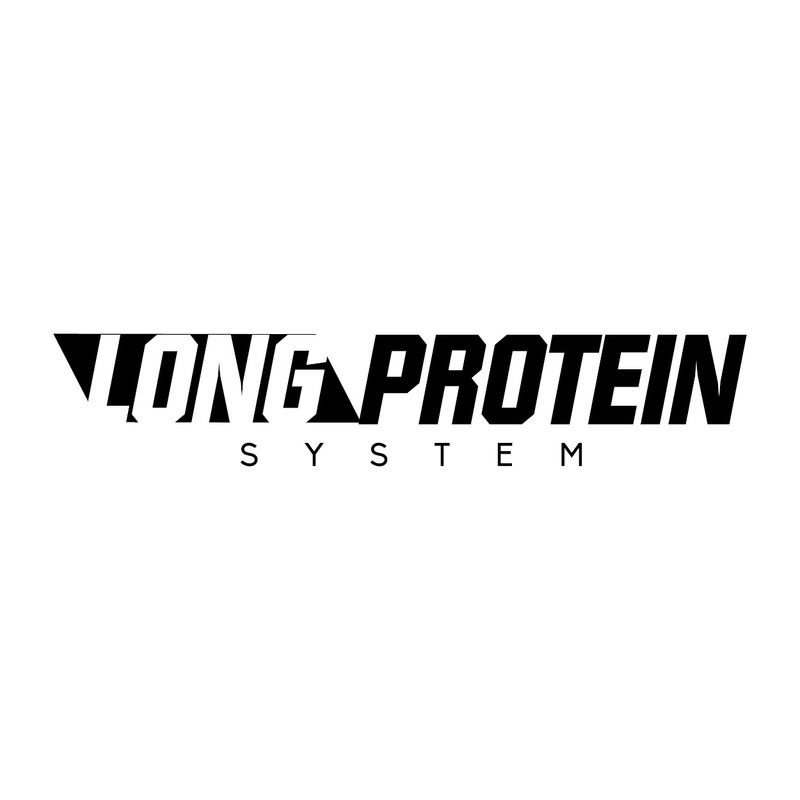 LONG PROTEIN contains a unique complex of selected protein sources (WPI, WPC, MPI) in a balanced ratio with the effect of gradual absorption. This unique product finds application as a dietary intake during the day, when you need to ensure a quality source of protein, as well as in muscle-building mode – here it is recommended as the last cocktail before going to bed. 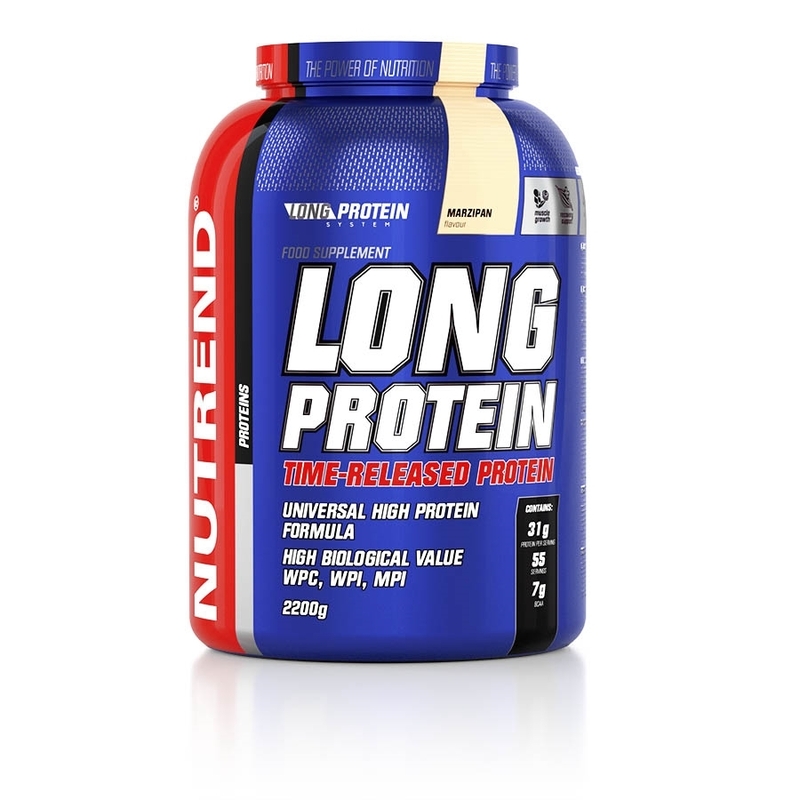 Sufficient quantities of quality protein contribute to muscle growth. 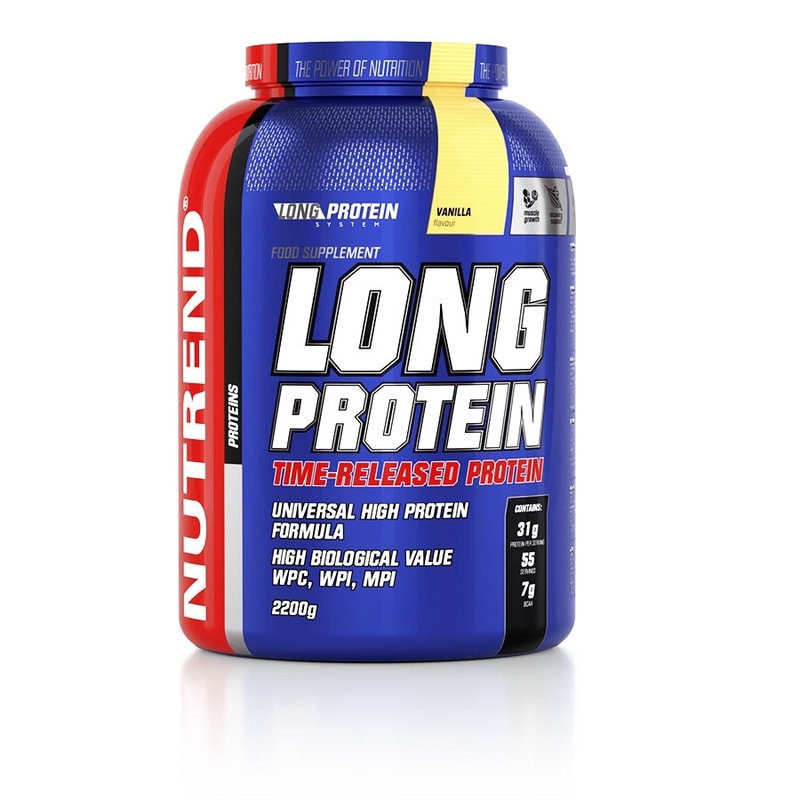 Using the NUTREND shaker, it is easy to mix this product. 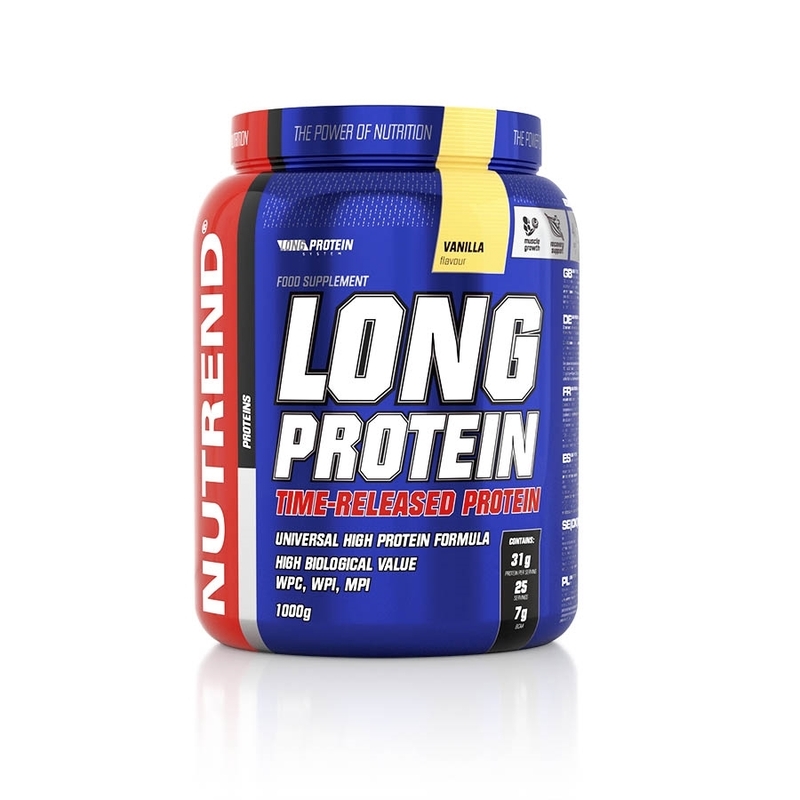 Intended for: strength training athletes focused on a high daily protein intake, muscle mass growth, reduction diet or ketogenic diet, lack of nutrients supplement for vegetarians. 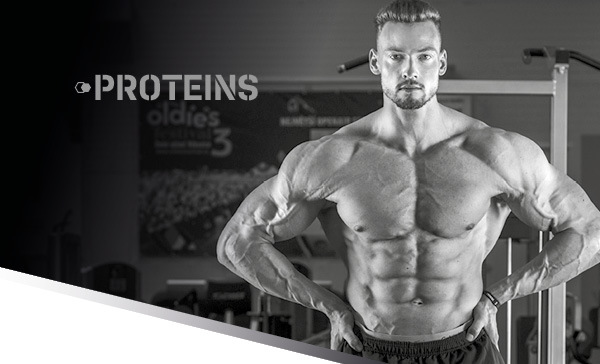 Recommended dosage: one serving = 40 g per 180 ml of water. 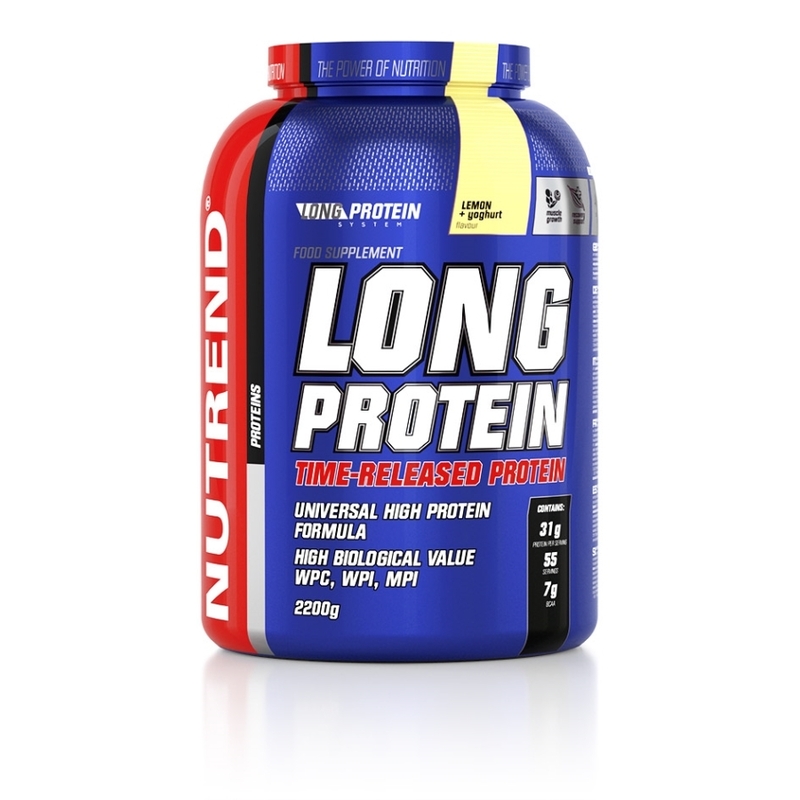 Depending on your daily protein need consume 1 – 2 servings per day, between meals. Do not exceed recommended dosage. 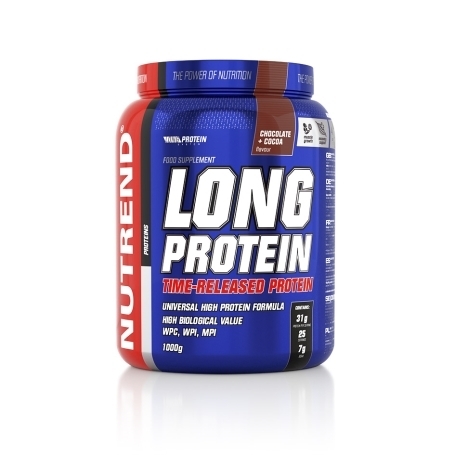 Vanilla flavour: Long Protein System 94 % (39 % whey protein concentrate, 22 % whey protein isolate (contains soy lecithin), 22 % calcium caseinate, 11 % milk protein isolate), flavouring, thickener polydextrose, L-ascorbic acid (vitamin C), anti-caking agents calcium phosphate and silicon dioxide, sweeteners sucralose and steviol-glycosides, pyridoxine hydrochloride (vitamin B6), cholecalciferol (vitamin D), colouring agent beta-carotene. The product contains allergens lactose and soy. 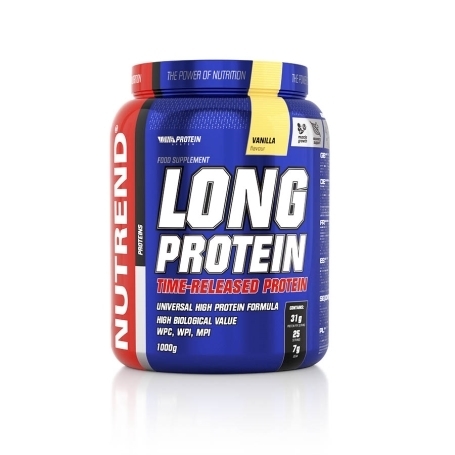 Lemon+Yoghurt flavour: Long Protein System 96 % (41 % whey protein concentrate, 21,5 % whey protein isolate (contains soy lecithin), 21,5 % calcium caseinate, 12 % milk protein isolate), flavouring, thickener polydextrose, L-ascorbic acid (vitamin C), anti-caking agents calcium phosphate and silicon dioxide, sweeteners sucralose and steviol-glycosides, pyridoxine hydrochloride (vitamin B6), cholecalciferol (vitamin D). The product contains allergens lactose and soy. Marzipan flavour: Long Protein System 94 % (39 % whey protein concentrate, 22 % whey protein isolate (contains soy lecithin), 22 % calcium caseinate, 11 % milk protein isolate), flavouring, thickener polydextrose, L-ascorbic acid (vitamin C), anti-caking agents calcium phosphate and silicon dioxide, sweeteners sucralose and steviol-glycosides, pyridoxine hydrochloride (vitamin B6), cholecalciferol (vitamin D). The product contains allergens lactose and soy. 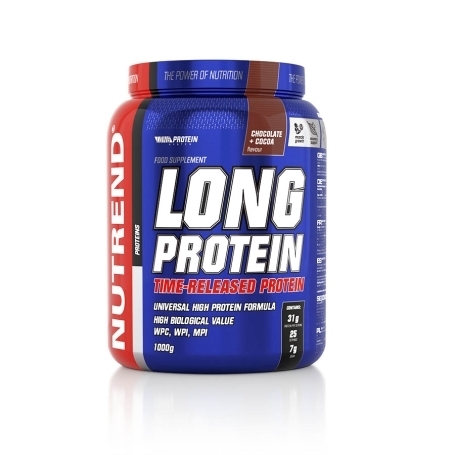 Chocolate+Cocoa flavour: Long Protein System 92 % (37 % whey protein concentrate, 22 % whey protein isolate (contains soy lecithin), 22 % calcium caseinate, 11 % milk protein isolate), cocoa, thickener polydextrose, L-ascorbic acid (vitamin C), anti-caking agents calcium phosphate and silicon dioxide, sweeteners sucralose and steviol-glycosides, pyridoxine hydrochloride (vitamin B6), flavouring, cholecalciferol (vitamin D). The product contains allergens lactose and soy.